Controlled folder access helps you protect valuable data from malicious apps and threats, such as ransomware. It is part of Windows Defender Exploit Guard. Controlled folder access is included with Windows 10 and Windows Server 2019. Audit mode allows you to test how the feature would work (and review events) without impacting the normal use of the machine. For more information about disabling local list merging, see Prevent or allow users to locally modify Windows Defender AV policy settings. Set the switch for Controlled folder access to On. If controlled folder access is configured with Group Policy, PowerShell, or MDM CSPs, the state will change in the Windows Security app after a restart of the device. If the feature is set to Audit mode with any of those tools, the Windows Security app will show the state as Off. Sign in to the Azure portal and open Intune. Click Device configuration > Profiles > Create profile. 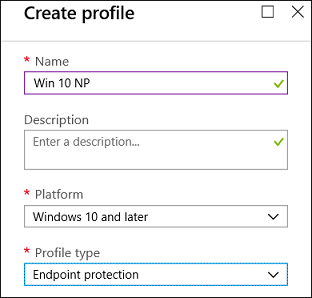 Name the profile, choose Windows 10 and later and Endpoint protection. Click Configure > Windows Defender Exploit Guard > Network filtering > Enable. Type the path to each application that has access to protected folders and the path to any additional folder that needs protection and click Add. >[!NOTE] >Wilcard is supported for applications, but not for folders. Subfolders are not protected. Click OK to save each open blade and click Create. Click the profile Assignments, assign to All Users & All Devices, and click Save. 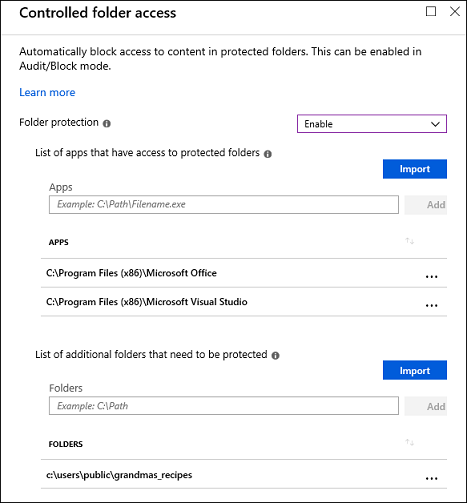 Use the ./Vendor/MSFT/Policy/Config/ControlledFolderAccessProtectedFolders configuration service provider (CSP) to allow apps to make changes to protected folders. In System Center Configuration Manager, click Assets and Compliance > Endpoint Protection > Windows Defender Exploit Guard. Click Home > Create Exploit Guard Policy. Enter a name and a description, click Controlled folder access, and click Next. Choose whether block or audit changes, allow other apps, or add other folders, and click Next. Review the settings and click Next to create the policy. After the policy is created, click Close. 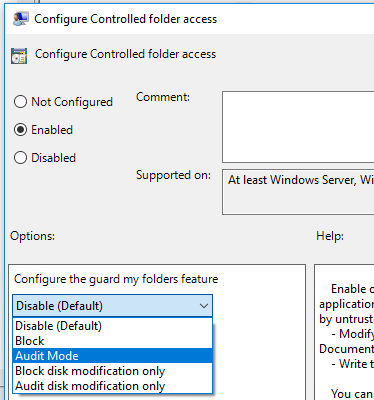 Disable (Default) - The Controlled folder access feature will not work. All apps can make changes to files in protected folders. Audit Mode - If a malicious or suspicious app attempts to make a change to a file in a protected folder, the change will be allowed but will be recorded in the Windows event log. This allows you to assess the impact of this feature on your organization. To fully enable controlled folder access, you must set the Group Policy option to Enabled and also select Enable in the options drop-down menu. Type powershell in the Start menu, right click Windows PowerShell and click Run as administrator. You can enable the feature in audit mode by specifying AuditMode instead of Enabled. Use Disabled to turn the feature off.